DestinyHoroscopes is a piece of software that is targeted to users that are actively engaged with horoscope reading. 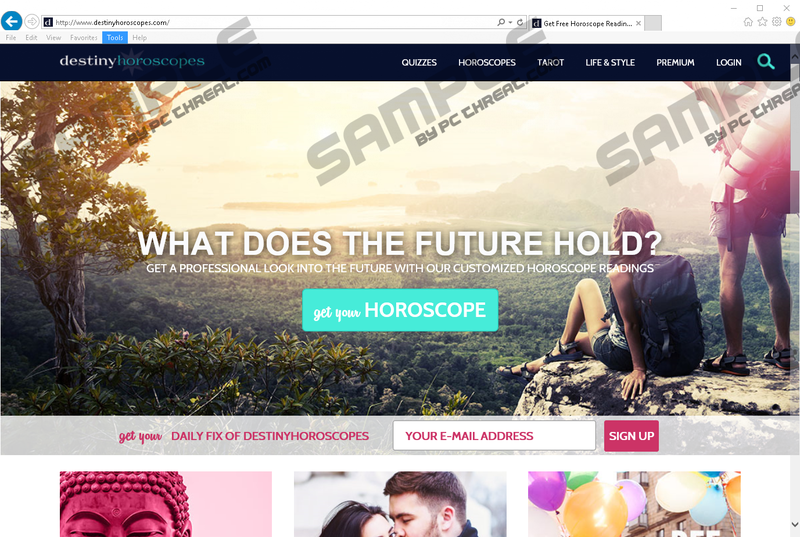 On its official website, this program is marketed as a tool that provides customized horoscope readings within your web browser, which should be extra convenient if you like to check-up daily on them. Unfortunately, that is not the whole deal with it. After receiving complaints about it, our researchers have conducted an extensive analysis of it and eventually categorized this program as nothing more than yet another adware application, which is capable of making your overall web browsing experience an annoying and frustrating one, to put it mildly. If you, unfortunately, are already affected by this devious program, make sure to follow the instructions presented below this report to get rid of DestinyHoroscopes in its entirety. At the very same time that DestinyHoroscopes is fully installed on your operating system, it will start a system service, which then will content various adware servers. Such connectivity is an imperative part of this ad-supported application since those servers are the primary source of all the unwanted content that you are presented with while surfing the web. Usually, content provided by this adware manifests as various third-party commercial ads, pop-ups, and coupons, which are of no relevance and cannot be considered useful in any way. In fact, such content presented to you will make surfing the web a rather difficult task as at times you might be forced to close down every ad, coupon, or pop-up individually just to continue your online session. In rare, extreme cases, your web browser might even crash due to the amount of devious content provided by the ad-supported program in question. Unfortunately, such invasive functionality of DestinyHoroscopes is not the worst part about it. This has been discovered during a deeper investigation of the content presented by it. In some situations, you might come across random ads, or pop-ups, which could prove to be embedded with redirect links, leading to questionable and even potentially dangerous websites. In some instances, a simple click on an ad or pop-up that might seem interesting and even useful could prove to be detrimental since you could be taken to websites, which could turn out to host malicious software. In more severe cases, you could end up on web sites that might be running an arbitrary code execution exploit, meaning that just entering it might be enough to infect your computer with some unknown malware. Such potentially dangerous functionality is the major reason our research team highly advises you to take immediate action and to delete DestinyHoroscopes. A complete removal of this adware is the only way that you can regain the default functionality of your web browser. If you consider yourself a security-conscious user, you must take preventative measure to minimize the risk of getting your PC infected with some devious program. It has been found out that DestinyHoroscopes in quite a few cases is distributed via bundled installers. To avoid them, you simply need to avoid all third-party download websites as they are notorious for providing software bundles for download. Also to avoid getting your PC infected in such a way, you need to be extra cautious while installing any application on your PC. This is critical since during a setup procedure you could come across a chance to cancel the installation of some devious unwanted program. Additionally, we firmly urge you to learn about the application that you wish to have as much as possible before actually downloading it. This is important because often developers of dubious software use misleading advertising strategies to lure unsuspecting users into obtaining a program without understanding how it functions. Last, but not least make sure to install a professional antimalware tool on your PC as it provides overall system security at all times. The complete removal must be executed without any hesitation since DestinyHoroscopes does not hold any beneficial features whatsoever. The instructions that we present below must be executed precisely to get rid of this adware in its entirety. Once you are done with the manual removal, it is highly recommended to analyze your operating system for potential traces associated with it. It is critical to delete any leftover files or folders linked to DestinyHoroscopes to stop its invasive functionality altogether. Select and then delete a folder called DestinyHoroscopes. Quick & tested solution for DestinyHoroscopes removal.